Nkuringo sector, one of the famous regions for Gorilla trekking in Bwindi, is located in the southern part of Bwindi Impenetrable National Park. It provides habitation to the famous Nkuringo habituated gorilla family which is headed by Rafiki and it is said to be the most fascinating gorilla family where by each individual gorilla is so amazing hence capturing great attention of the tourists. Nkuringo gorilla group has 19 members who are at times joined by some members from Bushaho gorilla family who cross from Rushanga sector. In the year 1997, Nkuringo gorilla family was the first group to be habituated in the whole of the southern part of Bwindi impenetrable National Park, in other words, in all the two regions in the south of Bwindi which are Nkuringo itself and Rushaga sector, and it is the first gorilla family from which gorilla twins were given birth to in the month of December 2004, hence bringing up the first records of gorilla twins in Bwindi Impenetrable National Park. This group is highly known for foraging outside the park for most of their time and this once led to the displacement of the local people who were at that time settling in the frontline villages in Nkuringo sector. Their rampant movement at that time once led to the outbreak of scabies in the Nkuringo gorilla family in the year 2000 which was later cured. Nkuringo region is found on a high altitude which makes it more strenuous for tourists to hike within the impenetrable forest in search for the habituated gorillas therefore this sector is highly recommended for the young, energetic and fit youths who will manage and enjoy the trek within the hilly forest. Nkuringo gorilla group is a neighbour to Nshongi gorilla family in Rushaga sector and just like any other habituated gorilla family, only a total of eight people are allowed to trek the gorillas of Nkuringo gorilla group and the age limit for gorilla trekking is 15 years therefore anyone below the age of 15 is not allowed to trek these gorillas. As you travel to Nkuringo sector for your tour, you will enjoy the beautiful and great views provided by the magnificent sceneries of the Kabale landscapes as well as the Nyiragongo and Nyimuragira of Congo which as well provided wonderful views in the sky at the time they erupted in 2010, the tourists in who visited this area at that time really enjoyed this. While travelling from Kampala, travelers can reach Nkuringo via the Kabale-Kisoro road and if you are using a bus, the journey lasts for about 11-12 hours or you can use a private vehicle. And Right from the junction on Kabale to Kisoro road, Nkuringo can be reached at about 45 kilometers which is about 3 hours. At times you can use the route via Buhoma through Kihihi or Butogota on a daily bus from Butogota but it’s more advisable to hire a private vehicle or a tour vehicle provided by a tour company. Besides Nkuringo Gorilla trekking, tourists can enjoy other activities in Nkuringo region such as Hiking, Bird watching and Cultural encounters. While at Nkuringo, clients who enjoy Bird watching will not miss out viewing the beautiful bird species at Nkuringo since this sector provides one of the best sceneries for bird watching as compared to other sectors. Therefore, if you are a fun of birdwatching, you will have a ride on Lake Mutanda using the dugout wooden canoe to the other side of the forest and you will be able to enjoy viewing the various colorful bird species and at the same time, you will also enjoy the beautiful scenery provided by the Virunga Volcano that lies just at the Uganda-Rwanda Border. 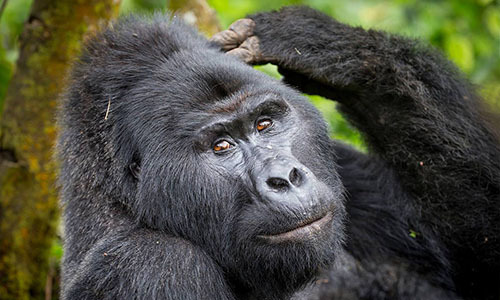 Right after enjoying gorilla trekking at Nkuringo sector, Tourists can proceed to Buhoma the next morning by having a nature walk through the impenetrable forest via the Ivy and Kashasha rivers as you enjoy the fantastic views within the forest such as the beautiful bird species singing in the air, as well as seeing some primates such as monkeys and many others as they enjoy their movements in the forest. You will be able to arrive Buhoma in the lunch time hours from where you can enjoy your lunch. While at Buhoma, you can still continue with the nature walk to the village of the Batwa and Bakiga local people where you will encounter with various cultural activities such as cultural performances in dance and songs which depict their past life in the forest, meeting the amazing blacksmiths and the traditional healer who treats the sick using local herbs extracted from plants, Observing the making of the various art and craft materials such as baskets, bags, mats, sandals and many others made by the talented local people of these communities. You will also discover more activities of the Batwa pygmies such as hunting, fishing as well as enjoying story telling about their past life and daily way of life. Nkuringo region of Bwindi also has favourable accommodation facilities such as clouds mountain gorilla lodge for luxury, Nkuringo safari lodge for budget, and Nkuringo gorilla camp for midrange. All these accommodation places provide delicious meals that will be sweet for your taste. We assure you that words only cannot describe the fantastic sceneries at Nkuringo as well as the activities carried out, but we do believe that Your visit to Nkuringo sector will leave you with a wonderful memorable experience of this sector of Bwindi Impenetrable National Park.